The 2013 iMac refresh was released yesterday, which came as a huge surprise because we thought we would see this unveiled next month during Apple’s October event. However, what has shocked us the most is that while the 2013 iMac comes with Haswell, the MacBook Pro did not. While it may seem good news to see the 2013 iMac refresh getting the improved processor, as well as faster Wi-Fi, the desktop has missed out on Mavericks. This was one of the reasons we assumed the new Haswell iMac release date would not be until late October, which is when we expect to see Mac OS X Mavericks made available to the public. This means that a free Mavericks iMac upgrade will be needed, and so you will be given a special code by Apple to use once the new OS is ready to download. We are not sure how long Apple will honor this, but surely it will be for any Mac device purchased this month? 2013 iMac specs — The design has not changed, but we did not expect it to because it received its new thin design less than a year ago. However, it does boast the next generation 802.11ac Wi-Fi, 4th generation Intel i-Series processor, which is known as Haswell, and also PCIe flash storage, which is much faster. 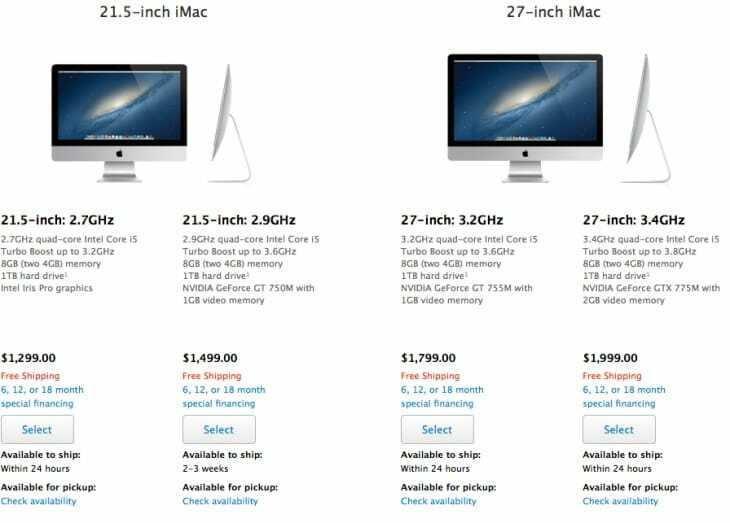 2013 iMac price — The price for the entry-level 21.5-inch model starts at $1,299 for the 2.7GHz i5 model or $1,499 for the 2.9GHz i5 model. As for the 2013 27-inch iMac refresh, the price will be $1,799 for the 3.2GHz i5 model or $1,999 for the 3.4GHz i5 version. They do have other difference, all of which are detailed here. We don’t expect the full benefit of the 2013 iMac performance just yet, this will come once Mavericks is released, but we guess puling some of the team off to work on iOS 7 has led to a slight OS X Mavericks release date delay — just hope we learn more next month during the iPad event? “2013 iMac refresh released with Haswell not Mavericks” Haswell is processor technology! not OS. its should be “2013 iMac refresh released with ‘OSX Lion’ not Mavericks”…..